Reduce your costs by using our surveyors on an as-needed basis versus the cost of your in-house, full time survey staff. 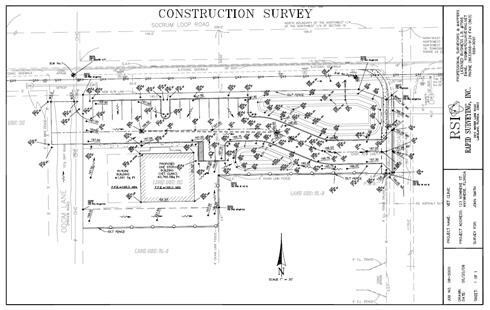 Construction surveying (otherwise "lay-out" or "stake-out"): the process of establishing and marking the position and detailed layout and grading of proposed features such as roads, buildings, utilities, drainage contours, etc. for subsequent construction. A construction control survey is a type of survey that is required when a contractor is using their employees to provide their own site construction stake out. This control survey consists of staking exact horizontal & vertical control points based on supplied plans. The contractor can be assured that his employees are building the project per plan locations. Here at Rapid Surveying we strive to give our clients construction stakeout points that are easy to read and follow, helping our clients and /or their sub-contractors to perform with great efficiency. With our years of experience working with local engineers & contractors we have stream lined a system that benefits all involved. From the owner/developer to the civil engineer to the contractors building the project we attempt to protect everyone’s interest. We review AutoCAD plans, paper plans and field conditions and notify our client of any potential problems that may delay the project schedule. By taking this extra care we have maintained many long term clients that have come to depend on our diligence.